There are many factors that may cause your computer to slow down over time. Defragging alone will probably not fix your problem. We look at what goes on behind the scenes. Our experts can analyze your systems and make upgrade recommendations if necessary. Pretty much anything that beeps, buzzes, and connects to the Internet, can be serviced. Let our experts adjust your mobile settings according to your needs. We can analyze your environment and come up with a custom solution that works best for you. We are familiar with all the latest standards and options. We have the experience and expertise, whether it’s replacing an outdated router with a more powerful one, using a network extender, powerline networks and even outdoor wireless networks. Few things can be more irritating than a computer that’s slow to start up. We are well versed at finding what is wrong and improving your computers performance. We have methods to make it faster than it ever was. Fall in love with your computer again! Keeping your business running smoothly requires building and maintaining a robust, highly available network. 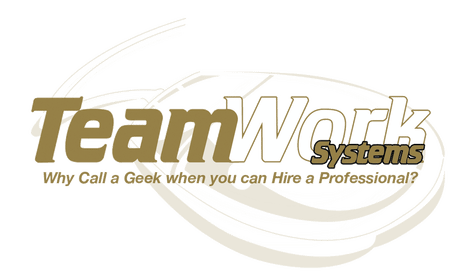 TeamWork Systems offers proven network design and implementation services that drive results for your business. You have purchased new computers for your home-based office, shop or small organization. Collecting it from the wholesaler or authorized dealer is far easier than hooking it up and then get it running. New PC setup and security is the important part that cannot be ignored after purchasing computers. Do you have sufficient resources and platforms for computer data recovery? Have you created back-up to avoid any potential data loss? For a single computer, it may an easy task. For organizations, educational institutes and similar other offices, you need an expert hand for computer data recovery and back-up. Is your computer performing slowly, or are you looking for a way to boost performance? If your computer is more than a couple of years old, replacing the hard drive with an SSD (Solid-State Drive) is one of the most cost-effective changes you can make. An all-in-one phone, team messaging, and video conferencing solution. Computer maintenance describes various steps to keep your computer functioning at an optimal performance level from a software and hardware point of view.